^ Fletcher, Seth. 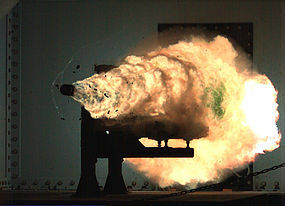 Navy Tests 32-Megajoule Railgun |. Popular Science. 2013-06-05 [2013-06-16]. ^ Rashleigh, C. S. & Marshall, R. A. Electromagnetic Acceleration of Macroparticles to High Velocities. J. Appl. Phys. April 1978, 49 (4): 2540. doi:10.1063/1.325107. ^ Rail Strike. The Economist. 2015-05-09 [2016-01-31]. ^ Atkinson, Nancy. NASA Considering Rail Gun Launch System to the Stars. Universe Today. 2010-09-14. ^ Hindmarsh, John. Electrical Machines and their Applications. Oxford: Pergamon Press. 1977: 20. ISBN 0-08-021165-8. ^ Fiske, D.; Ciesar, J.A. ; Wehrli, H.A. ; Riemersma, H.; 等. The HART 1 Augmented Electric Gun Facility. IEEE Transactions on Magnetics. January 1991, 27 (1): 176–180. ISSN 0018-9464. doi:10.1109/20.101019. ^ Batteh, Jad. H. Review of Armature Research. IEEE Transactions on Magnetics (IEEE Magnetics Society). January 1991, 27 (1): 224–227. doi:10.1109/20.101030. ^ Gully, John. Power Supply Technology for Electric Guns. IEEE Transactions on Magnetics (IEEE Magnetics Society). January 1991, 27 (1): 329–334. doi:10.1109/20.101051. ^ 50 megajoules kinetic energy. Wolfram Alpha. 2014-04-28.